We stand behind you Jeff!! ‘m Jeffery’s stepmother. Of all our children Jeffery is the kindest and softhearted of them all. He was not in the store when the shooting happened and did not know it would occur. I don’t agree with Texas parties law. To me this law seems very harsh for a driver or anyone not connected to the actual pulling of the trigger. Gov. Perry, I know that Jeff is just another inmate in a long list, but I ask you to review this case with an open mind, and heart. I do ask that Jeffery not be put to death; this is my wish. My prayer is that you and others will see through the wrong points of the trials… May God Bless each and everyone. Jeffery Wood only has one child and that is me!!! I have been without my father for many years, and I have suffered greatly because of this! I need my father. I need to be able to hug him, and to sit in his lap, and just talk when I need somebody. I have been deprived because of somebody else’s crime. Should I continued to be punished? I have had a lot to deal with over these years. I have struggled in school, I have been alone, and I have done it all without my lifeline…my father. Please do not kill him…he did not kill anybody. He is a kind, gentle man and I need him! If you kill him…you are killing me!!!!!!! Jeff Wood, my beloved brother, is a man on Texas death row, convicted by the absurd “Law of Parties”. 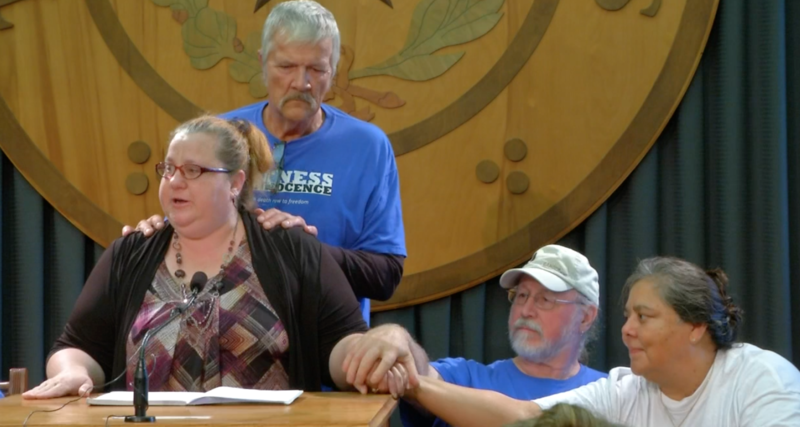 Although Jeff didn’t murder anyone, he received a death sentence for driving the “getaway car” because his daughter’s and family’s life was threatened! Jeff’s story is a long and heartbreaking one, and unfortunately most of it never came out (in public, or the courtroom) due to many unfortunate circumstances, (the biggest being our family’s lack of money to retain a decent attorney) but the state knows who committed the crime, and that person was unfortunately executed several years ago. In addition, Jeff’s rights were violated as he DID NOT receive a fair trial; as a matter of fact there were MANY, MANY mistakes made at his trial by Jeff himself, his LAWYERS, and the by the JUDGE as well. I am begging you to spare the life of my brother. He is no murderer! In fact, he has the biggest heart of anybody that I know…and always has. Yes, he has made some mistakes, but again he is no murderer, and should not be condemned to die for a murder he did not commit. Jeff Wood did not murder anyone. He was not even in the building when the murder occurred, nor did he possess any weapon at the time of the shooting. As a matter of fact, he made it a point to tell the “triggerman” not to bring a gun at all. Jeff is a loving and trusting person that was blackmailed, by threats made against his family and friends, into running with this shooter. Jeff Wood is not a murderer. Killing a human being is wrong. Inmates who sit on death row are human beings too. Remember? They make mistakes, just like you and me. Granted their mistakes may have been bigger, but a mistake is a mistake no matter how big or small it is! People should be punished for their mistakes, but killing people for their mistake is not a punishment, it is another mistake; another crime. Please do not add another mistake to this tragic event. Please spare the life of Jeff Wood. He is a human being too. In addition, I have always been taught that the sentence should fit the crime. Is that not correct? Jeff did not kill anybody so why should he die? His crime should only be aggravated robbery, if that! He has spent over 10 years on death row, don’t you think that is punishment enough? I do. Please show compassion and mercy! Pardon Jeff. Why should the he die for the crime he was charged with, but did not do, when he only has the comprehension level of a 4th grader? The courts said that he was the mastermind of the whole operation. Yeah right. The real mastermind was released due to testifying and then even lie on the stand. Come on now, There is no need for this. I am one of Jeff’s brother’s and I would like to thank everyone for signing this petition. There is no justice in killing someone that has not murdered anyone. This law is not fair and it needs to change. It seems pretty simple. 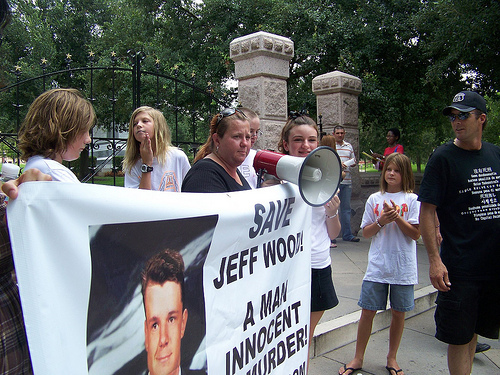 Jeff Wood did not kill anyone, yet our government can’t wait to take his life. And then they wonder why we have no faith in our justice system! I am Jeff Wood’s grandmother. I am writing in hopes that you will show mercy and compassion for my grandson, Jeffrey Wood. Please allow him a chance at life as he did not kill anybody. I am not against the death penalty when it is deserved and appropriate. Jeff’s death is not deserved OR appropriate. EXONERATE JEFF!